When you’re planning a family holiday with a baby, an important thing to consider is how your travel plans are going to affect your child’s sleep routine. You’ll have a much more enjoyable holiday if you organise your trip in a way that allows for as little disruption as possible to your little one’s sleep schedule. Planning ahead is key. Holidays are meant to be fun and enjoyable. No one wants an over tired, irritable, crying child while away on holidays. My holiday sleep tips will help to ensure that your child gets the rest he/she needs to be happy, healthy and alert during your trip, which is bound to make your holiday more enjoyable for everyone! If you are planning a holiday, plan it well in advance. Ensure that your baby sleeps well before you start the trip. More often than not, lack of sleep is a major reason behind your baby throwing tantrums. If you are planning for your child to sleep in a portacot while away and you have access to one before you leave, you might want to put it up in their room and let them have a couple of sleeps in it, before you go away. The night time sleep would be the best to try with. If you have portable blackout blinds, take them with you. If not, you might want to buy some. Make the room as dark as possible. This will help your child to fall asleep and stay asleep during the night, for naps and for the early morning wake up. I have 2 different types of black out blinds which are different sizes, which I take on holidays with us. One of the biggest mistakes parents make is to try to pack in all the fun and adventure they might have had back in their “child-free” days. 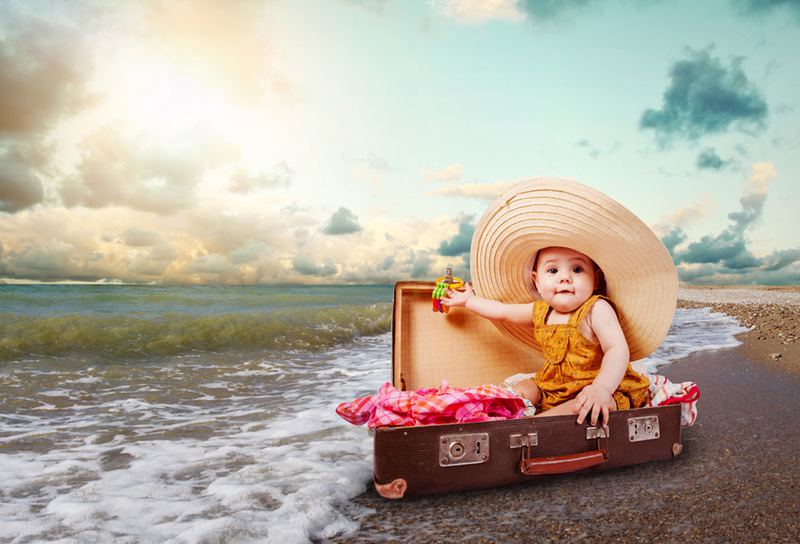 The fact is, when you travel with a baby/toddler you can’t plan to do everything in one day. When your baby is overstimulated and not having their regular naps in the cot, they will become over tired and cranky. It’s better to slow down the pace and make sure you schedule regular naps and early bedtimes, just like you would at home. Be as consistent with naps and bedtime as you can. Continue with your same bedtime/naptime routine that you have at home. Don’t let those boundaries move while you are away. An occasional nap in the car seat, pram or a later-than-usual bedtime probably won’t do too much harm. f Iyour baby’s naps are all over the place and he/she goes to bed much later than usual for several days in a row, he/she will become so overtired and cranky that a meltdown is inevitable, as is and prolonged settling at bedtime. Even if your baby is the best little sleeper in the world at home, when you’re in a strange environment, things might be very different. It’s normal for babies and toddlers to test boundaries around sleep when they are somewhere new. Just because you have certain rules at home, they won’t automatically understand that the same rules apply at Grandma’s house or away on holidays. But they do! In a strange place, your baby might cry for a while at bedtime or wake up at odd times during the night. The best way to handle this kind of behaviour is to react the same way you would at home. Go into the room every five to ten minutes or so to offer a bit of reassurance, but other than that, don’t bend your rules. If you hang on tight to your consistency, within the first night or two your child will be used to the new environment and will be sleeping well again. If your child has a treasured comfort item, it will go a long way to helping him feel safe and secure enough to fall asleep in a strange environment. If sleeping in a cot, I recommend taking your child’s cot sheets that have been slept in for a couple of days, and their sleeping bag if they use one. This will have his/her smell on it. The comfort toy and sheets will help your child feel safe and secure while in a different sleep environment. Another big mistake that parents make is to start sharing a bed with their baby or toddler while traveling. Even if it’s only for a few nights, if your child decides this is his/her new preferred way to sleep, you could find yourself dealing with a big problem when you get home, when it’s time to go back into the cot. If you are sharing a room, try and position the cot so that your child can’t see you. If they realise that you are in the room, it might become a game. If I need to when we go away, I rearrange all the furniture in the room. I put the desk or couch between the bed and the portacot and I try and position something between us, keeping us out of vision. If you are travelling into different a time zone, get your child into the new time zone ASAP. Depending whether you’re going backward or forward in timezone, your child might need an extra nap or might need to skip a nap that day. It’s important to continue to follow your normal bedtime routine so your child can recognise the sleep cues. On the first morning away, follow your normal morning routine at local time. The main tip is to have a great time away and enjoy yourself, so planning is the key. Everything may not go exactly as planned but that is ok. You are only away for a short period, so enjoy yourself and know that it won’t be long before your child is back in his/her own sleep environment and sleep routine.